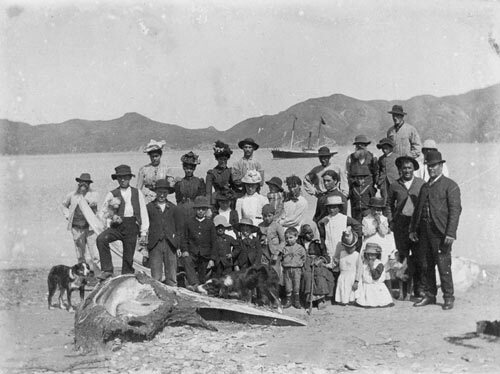 Whalers, their families and members of the Māori community pose with the head of a dead whale at Te Awaiti beach on Arapawa Island in the Marlborough Sounds some time before 1895. The elderly woman in the front row with a walking stick is Mrs William Keenan, whose Māori name was Katarina Hikimapu. H. Fisk (front, far right), was the captain of the Torea, the mailboat in the bay. Jim Norton (back, right) was the best lancer at Te Awaiti station, with responsibility for stabbing and killing whales after they were harpooned. His daughter Kitty Norton is one of the three young women with stylish hats in the back row. The social connections between whalers, Māori and those servicing whaling stations and marae are vividly represented in this photograph.